A Social Impact Bond is a contracting and financing model that involves a number of changes for most contracting environments. The shift towards outcomes-based contracting often poses the most significant change. It is challenging because the quantification and valuation of outcomes is new and difficult. For many people, SROI is synonymous with the identifying and valuing of social outcomes of a program or organisation. It is a framework that consolidates measurements and values, to compare the value of inputs and outcomes. SROI is attractive for use with SIBs because it explicitly collates both financial and non-financial value. SROI does not dictate how to measure effect size (change in outcome), or value outcomes, but does offer guidance on different tools that can be used for different purposes. To share other practitioners’ outcomes and values, the SROI Network has established the Global Value Exchange database. SROI assessments can be used to examine the effectiveness of one project, to compare different project designs, to compare different projects or to examine changes over time. The principles of SROI are consistent with SIBs. SROI has not been used in the development of Social Impact Bonds to date, but conversations involving both concepts are increasingly occurring across the globe: in the UK; Japan; Australia; and Canada. 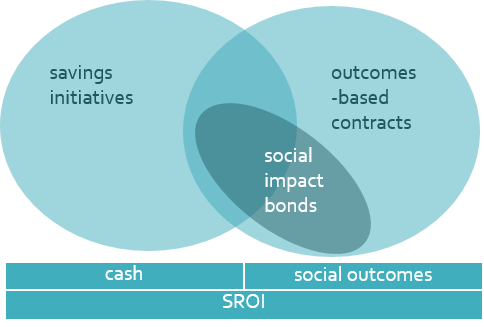 The diagram below maps some of the opportunities for using SROI in the design, operation and evaluation of a Social Impact Bond. One of the purposes of running social impact bond is to help NPOs scaling up. Is SROI analysis suitable for the big scale of SIB? Absolutely a SIB might be used to support the scaling up of an NPO or one of its programs. An SROI analysis can be very useful to understand the difference between the experiences of stakeholders at different sites of a large program. I don’t see any reason why SROI would be more suited to small programs – do you know of any? I would recommend that any large-scale SIB include a performance management system and employs a performance analyst to run it. This system should continuously collect, distribute and make decisions based upon information about progress towards social outcomes. SROI would certainly complement and inform the performance management process. Which particular function were you thinking of using SROI for? Some research had recommended SROI analysis be suitable for smaller projects because of its complexity. I would considered SROI to be an useful tool to calculate the SIB project’s Value for Money. Calculating value for money in a way that includes social value is something governments around the world are still trying to develop/discover. SROI is a great starting point, but you’d want to compare it to other uses of the money (i.e. the ‘opportunity cost’) to understand value. It’s easier to calculate value for money when comparing two programs that cost the same but promise to deliver different outcomes, or two programs that promise to deliver the same outcomes, but cost different amounts. It’s difficult when there are many scenarios for both costs and outcomes and even more difficult when there is nothing to compare them to! A common misconception is that if the total value of social return is above the cost to government, then it is necessarily a wise use of government money. If this was true, then government should pay for children’s birthday parties and football clubs! – The last illustration mentions steps “compare program”, ” compare investment”. Do you mean different programs or different module of the same program, in which case for me it makes more sense as one should not be comparing different programs with their SROI value. – Is there a case study / blog that shows how a SIB was conceptualized, with or without SROI being used?